Sneinton Festival 2012- first event! 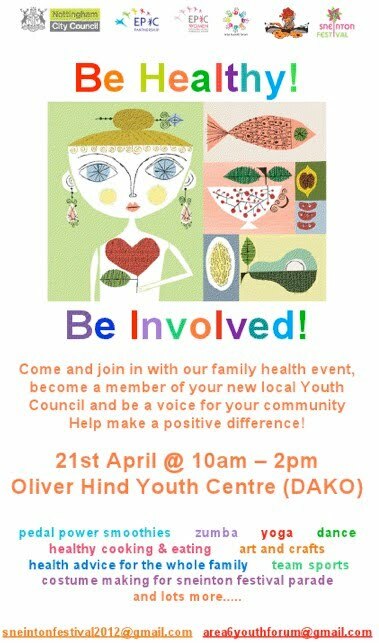 A free event brought to you by Sneinton Festival and the Area 6 Youth Forum at the Oliver Hind (Dako) centre. The event is themed around the first of 5 Olympic Ideals- Health... and there will be lots of activities for all of the family! It's also a chance to find out about and join the new local Youth Council- a strong voice for young people in the area. For further information please contact Beth Hemus on missbwise@hotmail.co.uk or Leanne Sutton on 07737230124.